The welcoming Lion Royal Hotel is situated in the centre of the picturesque market town of Rhayader, nestled in the heart of Mid Wales. this small market town is the gateway to the Elan Valley (the Lakelands of Wales) in Powys, mid Wales. There has been an hotel on this site accommodating travellers for centuries. Run by the Collard family since 1947, a warm welcome is always guaranteed at the Lion Royal. After a busy day of activities, our guests are drawn to the comfortable Chesterfield sofa in the bar. Kick back next to a roaring log fire and enjoy a traditional Welsh evening. Additionaly, we have a private residents lounge. Our traditional coaching inn is the perfect base for motorcyclists, cyclists, walkers and large parties. Our 15 ensuite rooms include single, twin, double and family options. Feel free to contact us if you have any queries about our rooms or want to check availability. We have a versatile function room to accommodate for up to 100 guests. 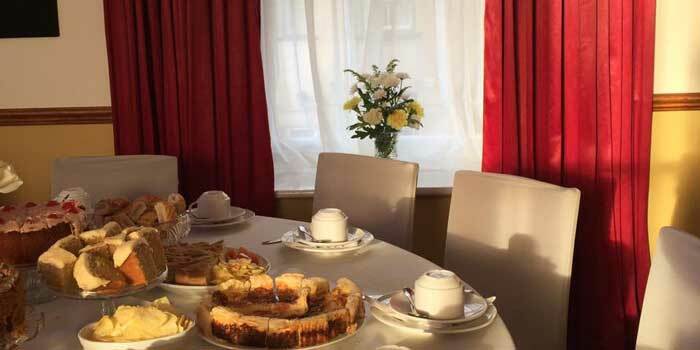 The newly refurbished Bank Bar is ideal for parties, dinners, funeral teas, weddings and community gatherings. As part of the refurbishment, we purchased the entire panelling, along with many fixtures and fittings of the late HSBC bank (formerly Midland Bank) in Rhayader.